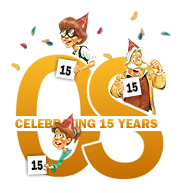 The Odyssey Scoop: Celebrating 15 Years! Today we celebrate a huge milestone here at The Odyssey Scoop! On December 22, 2000, The Odyssey Scoop began as a fan site to promote Adventures in Odyssey in the best way it could. And now, fifteen years later, we’re proud to say we’re still up and kicking and one of the expansive (and exhaustive!) fan sites around! Many of you have journeyed with us during the past 15 years, and even more of you have discovered us along the way. A big thanks, first and foremost, goes out to all of our dedicated and faithful followers, who share a love for Adventures in Odyssey and our website. It has been a privilege to work alongside our many encouraging and talented visitors who have provided feedback all these years. It’s hard to believe what started out a a small fan site would become a website with thousands of pages of content, a message board, and even a popular podcast. What we find most humbling is that some of our visitors from the early days are still checking back even today to follow the world’s most popular audio drama. Thank you, all! And of course, another thank you goes out to Focus on the Family for providing families with a quality series called Adventures in Odyssey. Without our friends at Focus who remain faithful to a series almost 30 years old, The Odyssey Scoop would have never been possible. Here’s the first 15 years at The Odyssey Scoop. Let’s see 15 more! And with 15 years under our belt, we’ve definitely got something exciting cooked up for a release very soon. What is your favorite feature here at The Odyssey Scoop? When did you discover our website? Let us know when you arrived and how you found us in the comments below! 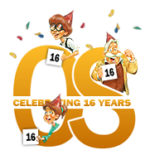 The Odyssey Scoop Celebrates 16 Years! Adventures in Odyssey Celebrates 29 Years of Wonder, Excitement, and Discovery!